These days, fewer and fewer people are choosing to own their own vehicle, preferring to live a car free lifestyle with walking, biking and public transit as their means of transportation. But the days of personalized vehicles aren’t behind us, with the rise of carpooling, carsharing, ridesharing, ridehailing and ridematching. Whoah, those are a lot of options and it’s easy to get them confused! Let us help you keep these services straight. According to the Carsharing Association, carsharing is “a membership based service available to all qualified drives in a community.” A fleet of cars are owned by the organization, and community members access them through a booking service for a specified period of time and rate. 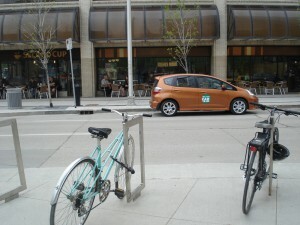 In Winnipeg, carsharing is offered by the Peg City Car Co-op. Various options to join are available, so you can simply assess the most economical means for you. It’s important to note that the cars are not driven by employees, but by the members. The cars have specific parking spots where they can be picked up and dropped off. Many businesses are choosing to join car co-ops, so their employees have access to vehicles during their business day to travel to offsite meetings, make deliveries and more. These two terms are interchangeable. Each involves people who own a vehicle giving rides to those who don’t (or sharing a ride, eliminating the use of multiple vehicles.) Of course, those who are getting a ride do offer compensation to the driver, such as providing gas money, exchanging services (“you drive to work, I’ll mow your lawn”) or other means mutually agreed upon ahead of time. See our guide for Sharing the Ride: Hints and Tips to keep it safe and fun! 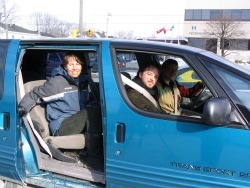 Carpooling is often recurring on regular basis (daily commute to work/school), where as ridesharing can also be used to describe a single-trip like those who are going on a long road-trip/ out of town event (i.e. Folk Fest) and are seeking someone going to the same place who would be willing to share the cost of travel. To coordinate these carpooling and ridesharing trips, Ridematching services are often used. Ridematching services use mapping to match those nearby seeking a ride/passenger to similar destinations. In Manitoba this is www.GoManitoba.ca (also a downloadable app). Learn about ridematching and ridesharing through GoManitoba here. Finally, we have ridehailing services. In the past, this would have simply referred to calling a taxi, but it is now an industry of different services, depending on which city you live in. The most common ridehailing services are Uber and Lyft. Winnipeg currently does not have either, but you may be familiar with TappCar. These new ridehailing services are accessed online through apps or websites, and connect you with a driver to take you to your location in real time. Those who own cars can sign up to be a driver, transporting people around their city in exchange for payment. Whether or not to allow Uber into the Manitoba market has been the subject of much debate over the past year. In the past, goverment has sided with Taxicab companies against services like Uber, saying that they are not safe for Manitobans due to the lack of insurance, necessary vehicle maintenance and other concerns, like lack of standardized rate fares (Cab Firms Unite to Keep Uber Away, Winnipeg Free Press). Time will tell if ridehailing can be kept out of certain markets by legislators and Taxi cabs. IMPORTANT NOTE: ridehailing services like Uber, Lyft and TappCar are not ridesharing because they are creating a ride that would have not existed otherwise (i.e. you are calling for a ride from someone who has to drive to you to take you where you need to go in the moment). 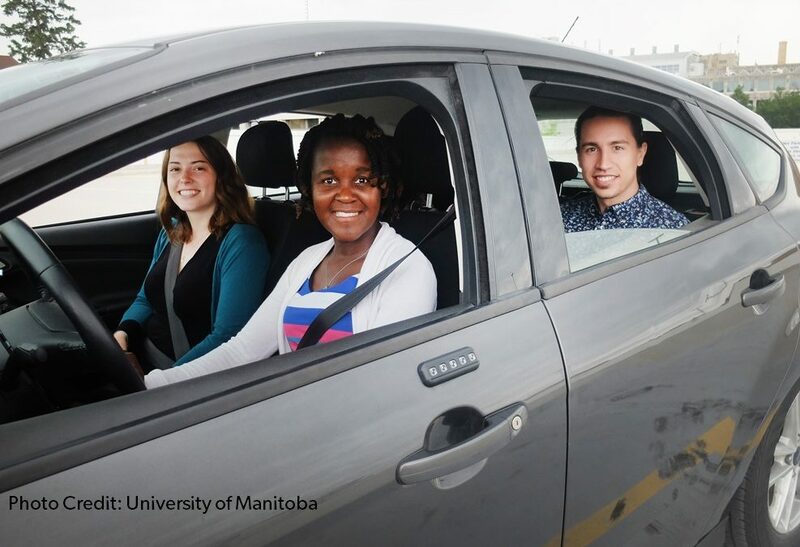 GoManitoba is a ridesharing/carpooling service because it connects you with people in your community commuting to work, school, or final destination nearby you to share the ride in one car, reducing a vehicle that would otherwise be on the road (i.e. it is intentional ride planned in advance, on a regular, long-term basis).